Episode 296 - Naruto Enters the Battle! Naruto makes his entrance onto the battlefield and uses his sensory powers to detect and destroy the transformed White Zetsu clones. During the battle, Shikaku updates Naruto with what they currently know on Madara. Naruto and Killer Bee engage in battle against the reanimated Itachi Uchiha and Nagato. Itachi learns from Naruto that Sasuke has chosen the path of vengeance. 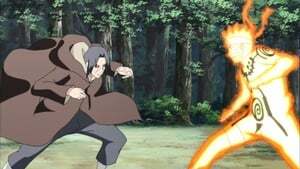 Itachi uses the ultimate genjutsu technique Koto Amatsukami to free himself from the Reanimation Jutsu. 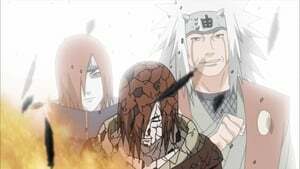 Itachi then joins Naruto and Killer Bee to fight Nagato, who is still under Kabuto’s control. The Fourth Company continue their fight against the reanimated Kage. 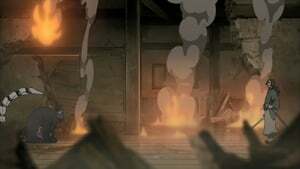 Gaara and Ohnoki team up to hold off Second Tsuchikage Mu, while the remaining shinobi take on the Second Mizukage, who is willing to be sealed away. 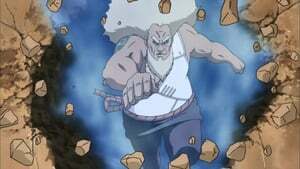 Temari leads the attack on the Third Raikage using Wind Style, but even her strongest jutsu is not enough to penetrate the Raikage’s invincible armor. 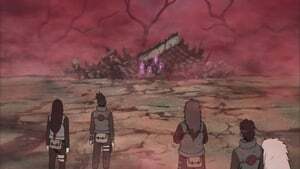 Gaara and Ohnoki manage to overcome the Second Mizukage’s mirage attack. Having taken an interest in Gaara, the Second Mizukage decides to further test the young Kage’s skills. 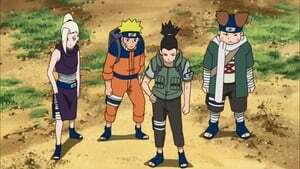 Shikamaru, Choji, Neji, and Kiba find themselves up against some familiar faces from the past. The Sound Ninja Four have been brought back by Kabuto’s Reanimation Jutsu, and they are ready to seek vengeance. Shikamaru, Neji, Choji, and Kiba succeed in defeating the Sound Ninja Four. But the enemy uses the Underworld Transfer Jutsu to trap the Leaf shinobi’s souls inside a barrier. Time is running out for the Leaf shinobi whose souls are trapped inside the Sound Four’s barrier. Ino and Shino exhaust their own chakra to keep their friends alive. Hinata defends Neji from a White Zetsu clone while he’s recovering from an earlier fight. 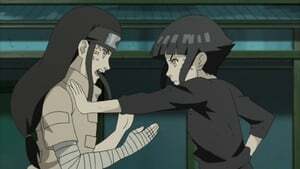 She then remembers the time Neji protected her the same way after she temporarily lost her sight. Three years ago, Leaf Anbu Yugao Uzuki lost her lover Hayate Gekko in battle. Unable to cope with his death, Yugao has since left the Anbu and joined the Medical Corps. Meanwhile, Kabuto has reanimated Hayate. Yugao is ordered by Sukui to track down the reanimated Hayate. Still shaken by her lover’s unexpected return as an enemy, Yugao manages to catch up to Hayate and his men. The Leaf Shinobi succeed in bringing young lord Shu into custody, placing a disguised Naruto as his double. 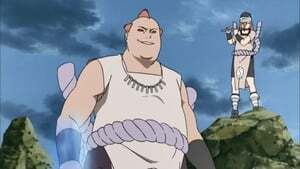 But Tatewaki soon uncovers Naruto’s identity and surrounds the intruder with his men. Madara is prepping his new jutsu Limited Tsukuyomi, choosing Naruto as his test subject. Meanwhile, Naruto is spending his day off alone in his room. Thinking that Naruto is lonely, Lee suggests they all go to the bathhouse for some relaxation. Might Guy arrives on the battlefield to stop a Reanimated Shinobi who he recognizes as Master Chen, the legendary Taijutsu User from the Third Great Ninja War. 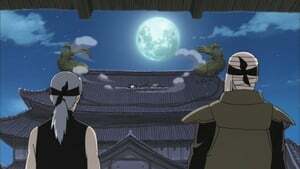 A reanimated boy who can control weather appears before Team Ino-Shika-Cho, Sakura, and Kiba, who are all fighting in different locations. To their surprise, the boy seems to know them. 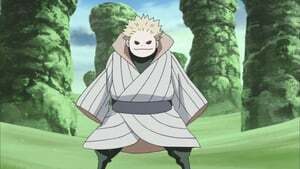 The weather-controlling enemy is revealed to be Yota, a boy who came to the Leaf Village years ago and befriended the local kids, including Naruto. Naruto and the others finally regain their lost memories regarding Yota. Years ago, the Leaf Village kids came to befriend Yota, but the adults believed the young boy was a spy and took him away for questioning. Kabuto reanimates an army of unknown shinobi led by Danzo’s former bodyguard Torune to retrieve the ones he lost to the Allied Forces. But aside from Torune, the reanimated shinobi are all weak and are quickly sealed away. Episode 317 - Shino vs. Torune! Kabuto reanimates Fukai to attack Killer Bee and Motoi. Fukai warns Killer Bee to escape before being taken over by Kabuto. 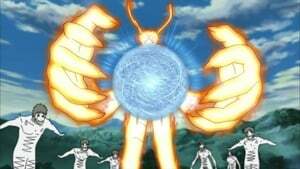 To everyone’s surprise, Fukai releases Eight Tails’ chakra and enters Tailed Beast State. 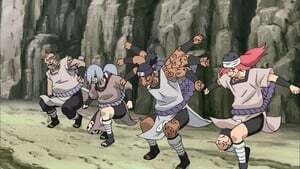 A reanimated Granny Chiyo attacks Kankuro and Mifune’s team. Kankuro fights back by using the human puppet of Sasori. 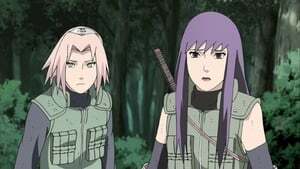 The sight of Sasori causes Granny Chiyo to recall the painful memories that led her grandson to create his human puppets. Episode 320 - Run, Omoi! 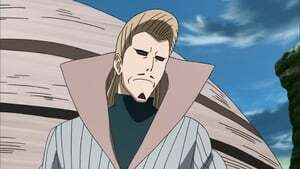 The Allied Forces receive a report that Omoi has deserted his post, much to the Raikage’s shock. It is soon revealed that Omoi has defied orders to go save the Thundercloud Unit.